It seems like every day our clients face questions around the “next great platform” and the need to be a part of it. Regardless of which platforms to pursue, an often overlooked question is: How do you seamlessly extend your product experience into multiple spaces? Recently we delivered a multi-platform solution for Bloomberg Sports’ NFL Decision Maker that illustrates some of the key points to keep in mind. 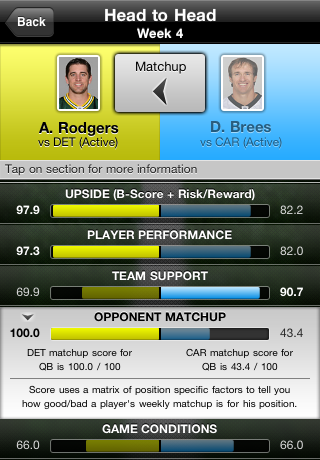 Check out the ‘Best iPhone Apps’ review of Decision Maker byAppSmile.com. 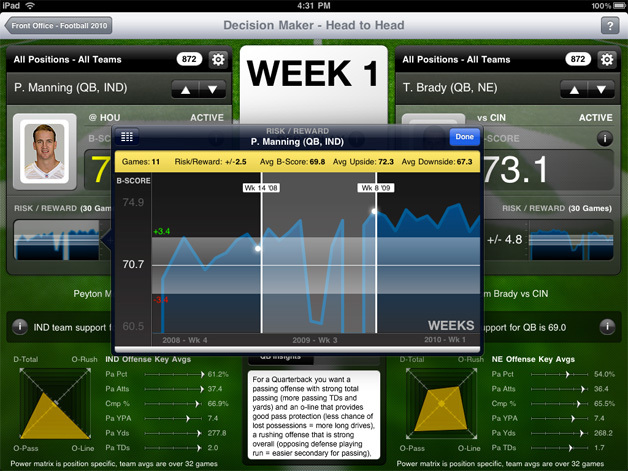 Bloomberg Sports’ NFL Decision Maker is a revolutionary sports analysis tool that provides fantasy football consumers with weekly player analysis of unparalleled breadth and depth. 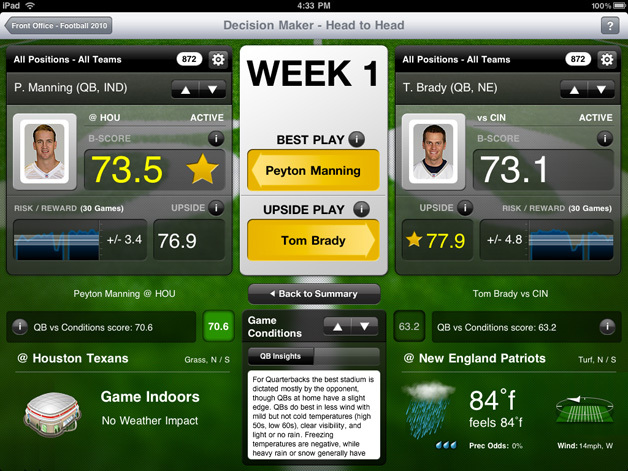 Following the release of the original web version at BloombergSports.com we worked with Bloomberg Sports to simultaneously extend the product across iPhone and iPad devices. The success rested on translating the application across different platforms while maintaining Bloomberg Sports’ cohesive brand identity and unique user experience. Each new platform tends to be environmentally different requiring a more intimate understanding of what people do and when they do it for each platform. As we translated Decision Maker for the iPad and iPhone we had to make choices about the quantity, style and structure of information. Similar in focus to the web version, the iPad release includes the same layered analysis within a more visually immersive and playful experience for iPad users. This contrasts with the iPhone release, which is targeted at brief interaction and is correspondingly leaner and more focused on responding to incidental requests. Less exploration, more answers, in an experience that while dynamic is fairly utilitarian. Understanding what each platform and device excels at and ensuring your product takes full advantage is critical to meeting the specific expectations of target users. A core market differentiator for Bloomberg Sports is rich and dynamic charting. As we conceptualized the iPhone and iPad offerings, we considered Apple iOS’ strong support for charting with advanced styling and dynamic, haptic behaviors that are natively available. For the iPhone we were more judicious with charting given the focus on essential information, with comparative and single side bar charts providing a uniform experience across the main application displays. In contrast, the iPad incorporates highly stylized charts and an additional interactive chart that is unavailable in the Web version (risk/reward chart). Different platforms can have very different interaction models (e.g., haptic/touch vs. non-touch or picking items from a list). Also, the scale of a given device can dictate a difference in focus that can have ripple effects across how a product behaves. A multi-platform strategy requires both an understanding of these differences and an ability to tailor the design to the space. 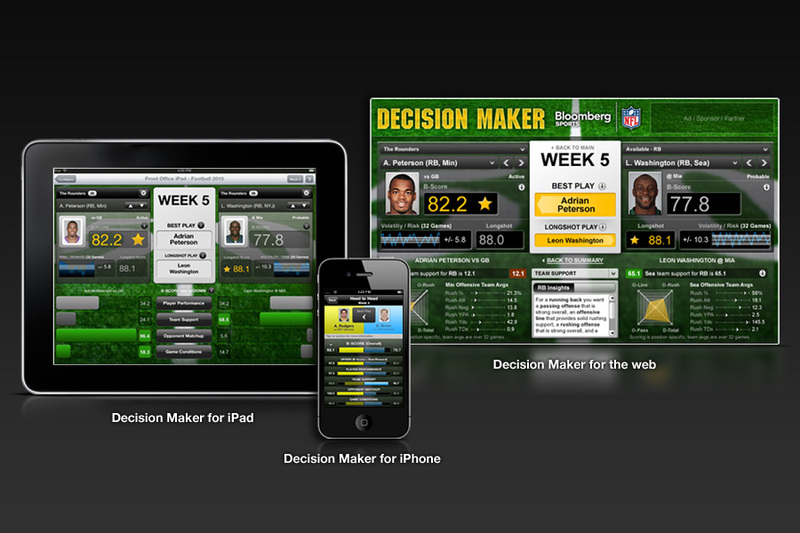 Thankfully the Decision Maker web application was designed to work on haptic devices like iPad and iPhone, so many of the core paradigms translated fairly easily. However, “passive” indicators needed to be rethought and interaction behaviors and controls needed to be redesigned to utilize Apple UI paradigms and components. Additionally, because users expect the ability to interact with everything in a touch medium, we also needed to make the interface more reactive and responsive. From the beginning, we ensured that the design for Decision Maker considered the need to deploy across different devices and products, and established a style that could be easily translated between different platforms. Differences in tone and scale between devices require a degree of translation and rethinking to adapt for the space. While the iPad and iPhone have different interface styles (buttons, menus, etc.) and physical/proportional differences, they utilize a common visual language and tone that both marries with the broader Bloomberg Sports brand and establish a unified product experience. The extensibility of the underlying framework allowed us to insure that different capabilities felt like extensions of a single product. Pursuing a multi-platform product strategy isn’t inherently more difficult or problematic than designing a single product. However, successful initiatives require that you think more broadly about your product and audience from the outset, establishing a vision that you can execute against a framework that can allow you to easily extend yourself into different spaces and experiences.